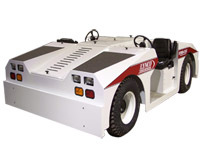 Take a look at our informative video showing the Hydra-Tug and Mini-Mover in action. Welcome to the Lynco Tugger Corporation. We manufacturer high quality towing equipment for Aviation and Industrial applications. We have a wide variety of towing equipment to meet your needs. Every Lynco Tugger is tested to meet the highest standards. We are looking forward to working with you to make sure that our towing equipment fits your customized needs. "LYNCO MODEL OF THE YEAR"
Avaliable towing capabilities up to 20,000DBP (300,000lbs). Pictured is the all new 10KD 4 wheel drive, 4 wheel steer with the ability to crab side to side. With a flip of a switch you have the ability to lock the rear wheels and have 2 wheel steer 4wheel drive. The units come standard with a passanger station but has the option of having dual operating stations. So that the unit can pull up to the load and then be driven away from the other station eliminating the driver having to look over his sholder which may limit visability. As with all of our units notice the clear hitch visability. Lynco Tugger Corporation © 2001 All rights reserved. Please direct any questions or comments about the website to the webmaster.